Sometimes mysteries get solved when you’re least expecting it. People who walk along Vine St. in the University Heights neighborhood in Menlo Park have undoubtedly noticed sculpture scattered amidst the plants. Who is the artist and how did they get there? The answer is Gari Merendino, who’s lived there for 27 years — and, we would learn, is something of a jack of many trades. 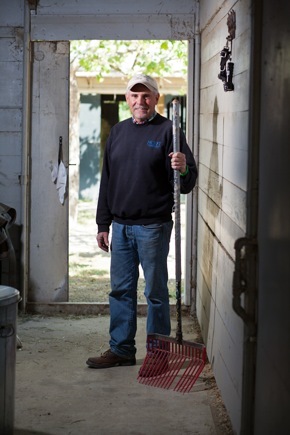 How the part-time sculptor and former retail executive — he worked for both Levi Strauss and Mervyn’s — finds himself running a non-profit that involves horses is a mini mystery of another sort. Like many in the economic downturn that followed the dotcom bust, Gari found himself unemployed. Finding that he could only do so much job hunting in one day, he started volunteering at NCEFT. When he found other employment, he continued to volunteer. The non-profit NCEFT, which Gari joined as a full-time employee in 2008, is celebrating its 40th anniversary this year. The organization helps children and adults with special needs move beyond their boundaries through the healing power of horses. Riders improve their balance, posture, mobility, coordination, and strength on horseback. For those unable to sit astride a horse, carriage driving is utilized, so they still get the sensation of having a pair of reins in their hands. As part of the anniversary celebration, NCEFT is holding a fundraising event, a Fun Day/Poker Ride & Walk, on June 18 where people can ride or walk the grounds of the nearby Runnymede Sculpture Farm. Details about the event are on the organization’s website. Gari and the rest of the staff also work hard at partnering with other non-profits. The Menlo Park-based Peninsula Volunteers just used the facility to raise funds for its programs benefiting seniors. Other nonprofits come just to enjoy the ambiance; a group from Abilities United has frequent lunches under the trees.